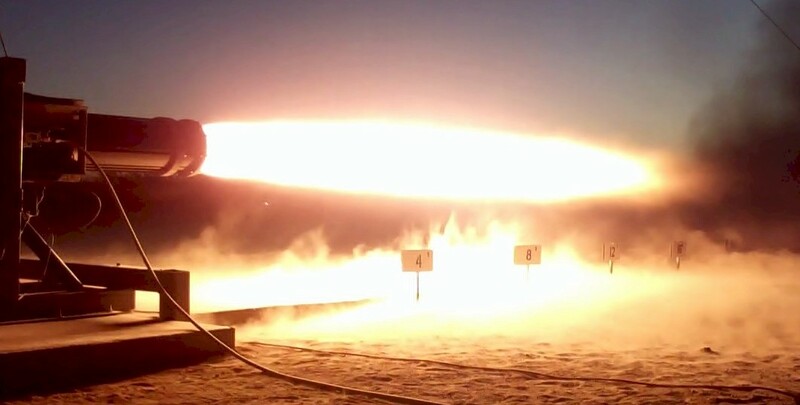 The first test firing of Interorbital Systems' new General Purpose Rocket Engine (GPRE) was a success earlier today, when IOS employees performed a short burn to confirm the engine's thrust characteristics. The engine, the IOS GPRE 7.5KNTA (General Purpose Rocket Engine) blasted a 22-foot plume of fire across Interorbital’s Mojave Spaceport test area, scorching the sand an additional 50 feet beyond the plume end. The composite-chambered 7.5K-pound thrust engine is currently the largest rocket engine in the world utilizing high-density, storable nitric acid and turpentine as propellants. This static firing marks a major milestone in IOS company history. The GPRE will be the main engine of the Common Propulsion Module (CPM), the building block of IOS' NEPTUNE rocket series. With this test coming quickly on the heels of the company's Vernier thruster test, the two propulsion systems for the CPM are now tested and ready for launch. IOS’ first orbital launcher will be a seven-module rocket designated the NEPTUNE 7, consisting of seven CPMs powered by 7 GPRE 7.5KNTA engines. The NEPTUNE 7 will lift a mixed manifest of approximately 24 TubeSats and CubeSats on each launch. Copyright 1996 - 2018 Interorbital Systems. All rights reserved.